Adam Willman and Aleyna Bakirli talk about their experience at the World Food Prize Global Youth Institute Monday. Marshalltown High School students Adam Willman and Aleyna Bakirli represented their school on a global stage in October as participates in the World Food Prize Global Youth Institute. 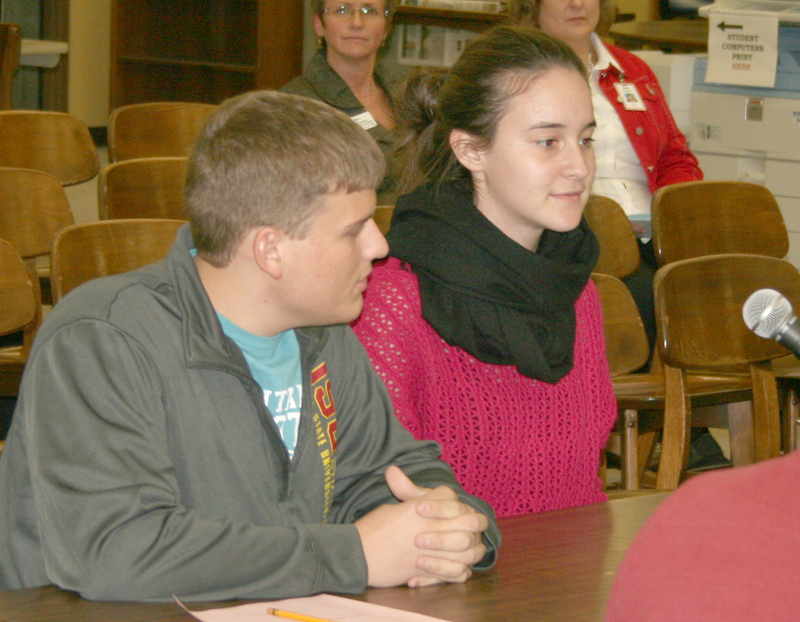 Both were on hand at Monday’s Board meeting to discuss their experience at the event, held in Des Moines Oct. 17-19, 2013. The students had the chance to meet international dignitaries, hear from Food Prize laureates and interact students from around the globe, all focused on ways to solve hunger. Nearly one out of three Marshalltown High School students were enrolled in college-level coursework last year, a significant increase from the year before. “We have a multitude of opportunities and outshine other districts,” said Meri Edel, MHS guidance counselor. Edel and Connie Gardalen, Marshalltown Community College dual credit coordinator, told the Board about the four ways MHS students can earn college credit while still in high school. The most common way to earn credit is through the dual credit system, where students take classes on the MHS campus taught by instructors with a master’s degree in the content area. Students in dual credit courses earn both high school and MCC credit. “That’s where we have huge opportunities for kids,” Edel said. Another parthway is Post-Secondary Enrollment Option (PSEO), which is for courses not offered at MHS. Students take the course at MCC and again earn both high school and college credit. Career Academies offer a set of courses in a specific trade. Students take pre-requisites at MHS, then enter the academy at MCC (usually in their senior year), earning both high school and college credit. “It’s very hands-on opportunities,” Edel said. Some of the Career Academy courses include construction trades and broadcasting. Gardalen said next year MCC will be adding an electrical career pathway as well. The fourth pathway to college credit is the Advanced Placement course. These rigorous courses are taught at MHS by AP-certified staff. Students complete coursework and take an exam through the College Board, earning college credit if they receive a high enough score. Edel said some AP courses are also offered online, noting the work of Extended Learning Program teacher Susan Fritzell in helping identify courses to meet the needs of talented and gifted students. Edel said the best part of these programs is the cost. While enrolled at MHS students can take the college coursework without paying for college tuition. While there are some fees for things like AP exams, the majority of costs are covered by the school and not students and their families. “Having just sent a son to college…it’s just dollars back to us,” Edel said. Students increasingly taking advantage of dual credit opportunities. In fall 2012 MHS students were enrolled in 794 dual credits. This fall students are taking 1366. A large part of the increase is the addition of Project Lead The Way programming, which offers dual credit in Principles of Engineering and Biomedical Sciences. Edel says as PLTW continues to grow in the coming years the number of students taking college-level coursework will increase as well. After re-bidding the technology components of the Support Services Building project, the Board approved the scope of work and project schedule Monday night. The project consists of the technology cabling associated with the two floors of the Support Services Building which will eventually house district offices. The revised project schedule anticipates bid approval Dec. 16, 2013, with substantial completion May 23, 2014. Monday’s Board of Education meeting included a report about progress made during the past year on Indicator 2.3 of the District Strategic Action Plan: Increase the percentage of students enrolled in college level coursework. During 2012-2013, 20 percent of Marshalltown High School students took college level coursework. In 2013-2014, that number has grown to 30.7 percent of MHS students. The increase is due, in part, to introduction of Project Lead The Way courses at MHS – though there are numerous other ways to earn college credits (for example, Advanced Placement courses and Career Academies). Anyone interested in learning more about these valuable opportunities is encouraged to view the MHS Course Description Manual for 2014-2015 on the district website (click on “Senior High School” and then “Counselor’s Corner”). 501.5 Resident Students, waive second reading. 502.1 Student Discipline Policy, Attendance policy covers a lot of elementary-level issues related to tardiness – remove it from the discipline policy (Delete 4B); Under section 6, change “will” to “may”; bring back for first reading. 502.2 Search and Seizure, mark reviewed. 502.3 Cooperation with Law Enforcement Officials, will ask the school attorney about language. 502.4 Physical Restraint, mark reviewed. The Board approved a Four Oaks Consortium contract Monday, allowing outside districts to utilize Four Oaks classroom. The agreement states those districts will then reimburse Marshalltown Schools for the actual costs of serving those students. Matt Cretsinger, director of special services, told the Board if all the Four Oaks slots are filled and students from within the District are identified for services they will take priority and he would work with the outside districts to find alternatives for their students. Cretsinger said currently there are six outside districts expressing interest in placing students at Four Oaks. The Board approved substantial completion of the medium voltage electrical service project at Marshalltown High School. The project, which cost about $1.4 million, updates electrical equipment at MHS and removes the risk of power loss at the high school. “It’s one that makes our district way safer than it was,” said Sherm Welker, board president. The Iowa Department of Education has named Marshalltown Community School District a “Platinum” district for its timely certified enrollment count. The DOE recognized 159 districts as being “Gold” level, which means they met three data submission targets set by the state. Districts receiving “Platinum” distinction met those targets for the second consecutive year. Marshalltown is one of 52 districts – or 15 percent of Iowa districts – to meet this standard. Lisa Koester, director of human resources and student issues, told the Board about this recognition Monday evening. She thanked Sharon Baughman, Stacey Mommer, Keri Ashby and Ginger Jacobson for their work on submitting enrollment data to the state, as well as the numerous others who supported the process. During Monday’s meeting the Board of Education approved Voluntary Early Retirement Incentive Program policies for Licensed Teaching Staff, Twelve-Month Secretaries, and Administrators (Policies 314.1, 407.7 and 413.7, respectively). These policies may be viewed on the MCSD website by clicking on the “Staff Resources” tab. Respecting the November 2012 decision of a previous Board, voluntary early retirement is not an option for the current 2013-2014 school year. Sometime between July 1 and September 30, 2014, the Board will make a decision about the Program for the 2014-2015 school year. Thanks go out to everyone who provided input during the recent process of policy revision – your comments were both helpful and appreciated. 407.6/314.1/413.7 – Early Retirement Incentive Programs, approved and waived second reading. 500.1 Objectives for Equal Educational Opportunities for Students, changing “buses” to “vehicles” and “legal guardian or custodian” to “legal custodial guardian”, approved and waived second reading. 501.3 Attendance Center Assignment, last part of first sentence and second paragraph struck from policy, approved and waive second reading. 501.4 Attendance Records, mark reviewed. 501.5 Resident Students, add “and/or designee” after superintendent. 501.6 Non-Resident Students, mark reviewed. 501.7 Foreign Students, mark reviewed. 501.9/R Open Enrollment – Sending District, mark reviewed. 501.10/R Open Enrollment – Receiving District, mark reviewed. 501.11 Student Transfers In, mark reviewed. 501.16 Homeless Children and Youth, mark reviewed.